Step 1. Specify a GARCH model. Step 2. Simulate from the model without using presample data. Step 3. Simulate from the model using presample data. Step 4. Look at the unconditional variances. This example shows how to simulate from a GARCH process with and without specifying presample data. 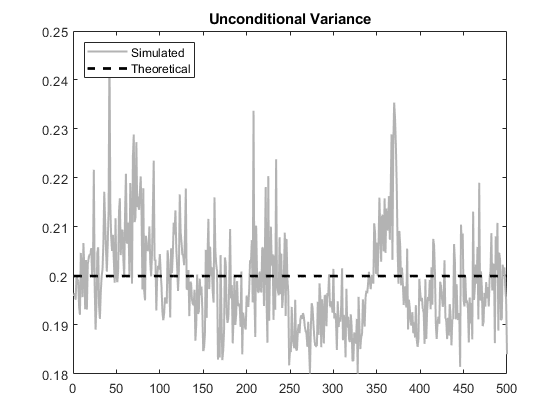 The sample unconditional variances of the Monte Carlo simulations approximate the theoretical GARCH unconditional variance. 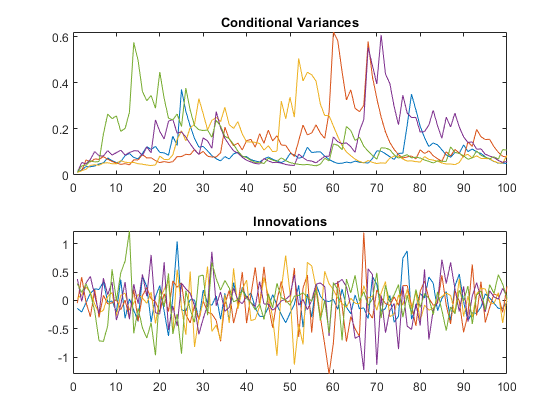 Description: "GARCH(1,1) Conditional Variance Model (Gaussian Distribution)"
Simulate five paths of length 100 from the GARCH(1,1) model, without specifying any presample innovations or conditional variances. Display the first conditional variance for each of the five sample paths. 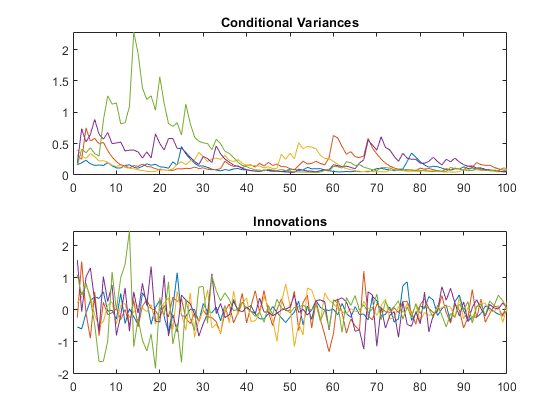 The model being simulated does not have a mean offset, so the response series is an innovation series. The starting conditional variances are different for each realization because no presample data was specified. Simulate five paths of length 100 from the model, specifying the one required presample innovation and conditional variance. Display the first conditional variance for each of the five sample paths. All five sample paths have the same starting conditional variance, calculated using the presample data. Note that even with the same starting variance, the realizations of the innovation series have different starting points. This is because each ε1 is a random draw from a Gaussian distribution with mean 0 and variance σ1=0.0113. 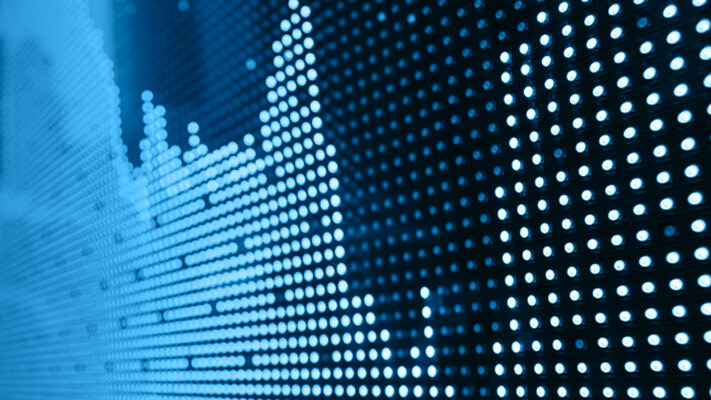 The simulated unconditional variances fluctuate around the theoretical unconditional variance.